Olin's Covered Bridge Museum Presents . . . This year Olin's Museum of Covered Bridges will kick off the summer with a new event that we hope will be useful to covered bridge collectors as well as provide a fun day of sharing and fellowship for our wide spread "covered bridge family." So get out your bridges and dust off your doubles. New or used collectibles, post. Cards or hand made crafts. Anything covered bridges, nothing but covered bridges. It is the event covered bridge lovers have been waiting for. Whether you have something to sell, trade, or just want to browse, come and join us for what is sure to be a good time. It's a great way for covered bridge crafters to show your stuff and a perfect way for collectors to find that special item you've been looking for. Food will be available. Mark your calendars. Saturday, June 24 10:00 A.M. - 5:00 P.M. rain or shine. Table space is available for $10.00 donation. If you wish to purchase table space and you do not have your own canopy, we can provide one for an additional $5.00 fee. Olin's Museum of Covered Bridges invites you to take a walk through America's covered bridges. While visiting the museum, you will learn about covered bridges of the past as well as the present. Enjoy art, artifacts, and educational displays. You will also see the many fun and unique covered bridge items on display that comprise the collection of the late Naomi Olin Bottorf. Our informational tour is an excellent introduction to the history and basics of covered bridges for people of all ages. Whether you are new to the covered bridge scene or a seasoned bridge buff, Olin's Museum will prove to be a worthwhile stop on your drive through the bridges of Ashtabula County. If you are a post card collector, be sure to check out our large collection of vintage post cards on display. The museum gift shop features covered bridge collectibles including t-shirts, mugs, post cards and hand sketched Christmas ornaments. 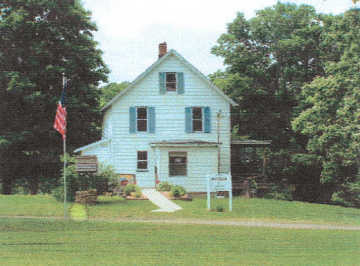 Located within walking distance just east of Olin's covered bridge on Dewey Road, the museum is owned and operated by members of the Olin family. If you are in the area and would like a tour during off hours, be sure to call anyone of the curators listed to see if they can accommodate you at the time of your arrival. Groups welcome. Our Mission - We are a non-profit organization. 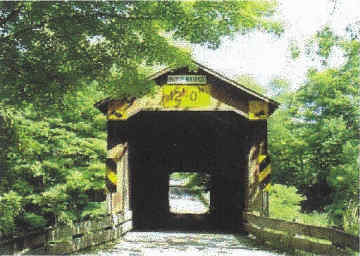 Our mission is to build public interest in the knowledge and preservation of covered bridges. ***Special hours are held each year during the second weekend of October. 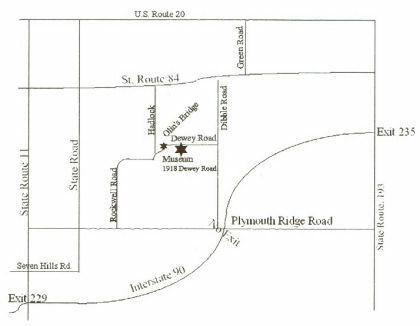 Hours are: 10:00 A.M. to 6:00 P.M. Saturday and Sunday of that weekend only. We are closed during the second weekend in September.